Alelie Ocampo is a member of RBC’s Inclusive Recruitment team. The Inclusive Recruitment team partners with hiring teams and community networks to identify qualified talent, to build the RBC brand in the communities, and to build a strong diverse pipeline of external talent. As the Program Manager of a contract program, Alelie works closely with Skilled Newcomers to Canada, Recent Graduates, and People with Disabilities. Born and raised in Montreal, Alelie works between her hometown and Toronto. She holds an BA in Honors Sociology from Concordia University and an MA in Sociology from the University of Western Ontario. Alelie joined RBC in 2016 as a recent graduate, through a national rotational program (Career Launch Program) that led her to the Inclusive Recruitment team where she works today. Alelie self-identifies as a young professional, visible minority woman, who goes by the pronouns “she/her.” As a diversity and inclusion practitioner, she is a strong advocate of increasing the representation of marginalized groups in leadership roles. Racheli Edelkopf directs family support and development at Friendship Circle, a non profit that creates friendship and inclusion in the lives of individuals with disabilities. 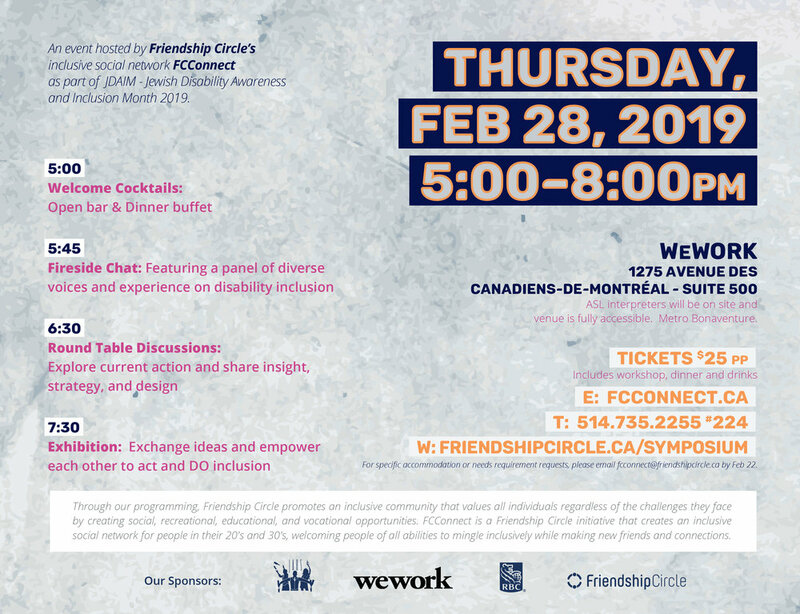 Since joining Friendship Circle of Montreal in 2015, she's worked on various innovative project to create immersive inclusive experiences for children, teens, and adults. Racheli co-directs FCConnect Friendship Circle's inclusive social network for young adults. Racheli, a native to Brooklyn NY, got involved as an inclusion advocate by volunteering at Friendship Circle of Brooklyn in High School. After graduating she worked as program coordinator at Friendship Circle of San Diego and Friendship Circle of New Jersey. She then joined the Friendship Circle International team to create programs and resources to be used by FC chapters worldwide. Adam Greenberg aka TB1 is one of Montreal’s most versatile entertainers. He has his own show on Virgin Radio (Monday- Thursday 6-10pm). He has toured all of North-America as a DJ, and has been responsible for music and video content garnering millions upon millions of views and plays. With his experience in creating for social media, he has now parlayed that into creating a Big and Tall clothing brand called ONE BONE. He is also continuing to expand his reach by opening a restaurant in the spring. He is a content creator in the truest form and continues to make a career in doing something that he loves, entertaining. Enrico Quilico is a doctoral student in the Rehabilitation Sciences at the University of Toronto and runs a cross-provincial community-based exercise program for people with moderate to severe traumatic brain injury (TBI) out of Montreal. His doctoral research is federally and provincially funded and revolves around the co-creation, implementation, and evaluation of that community program. Enrico has been working as an advocate for awareness and inclusion for the TBI population since 2008. Enrico’s Bachelor of Education is from Concordia University (Teaching English as a Second Language) and his Master of Arts is from McGill University (Adapted Physical Activity). He works as a CEGEP professor at TAV College, where he teaches English, Humanities, and Physical Education. Enrico has also been working as a leader in the fitness industry for past decade through the YMCAs of Quebec. Enrico is endurance athlete and competes for Masters Swimming Canada where he has titles at both the provincial and national level. He is a marathon runner and also competes in triathlons at the Sprint, Olympic, Ironman 70.3, and Ironman 140.6 level. In 2016, he completed the Lake Placid Ironman and rose over $10, 000 for Brain Injury Canada. Mariloue Daudier is passionate about diversity, inclusion, mobilization and collaborative practices. She holds a bachelor in Social Work from McGill University and a Masters of Management in the context of social innovations. Mariloue has more than four years of experience in coordinating social projects, including initiatives aiming at the inclusion of immigrants and people living with disabilities. Previously, she worked as the Enable Montreal Project Coordinator at the Office of Community Engagement of Concordia University. She now works as a Project Manager at the Comité sectoriel de main d’oeuvre de l’économie sociale et de l’action communautaire and she sits on the board of an adapted housing project, ÉquiToît. Born and raised in Dollard-Des-Ormeaux, Steven has Asperger’s syndrome, a high functioning form of autism. He hasn’t let it stop from pursuing his passion for music. Steven has ten years of experience as a singer and has performed in prestigious venues such as The Rialto Theater and Place Des Arts. He hopes to inspire others through his message that no matter what your disability is, anything is possible. He is at Concordia University with the eventual goal of becoming a Music Therapist.